The tomograph represents fully-autonomous measurement unit for collection and tomographic processing of the data obtained. Measurement unit contains a matrix antenna array from 48 (12 blocks, each containing 4 elements) law-frequency broad banded transducers of shear waves with dry-point-contact and ceramic wear resistant tips. Hence they can work with rough surfaces for the long time. Each transducer is equipped with an independent spring suspension, thus allowing inspection on the uneven surfaces. Nominal frequency of the array is 50 kHz. Instrument’s interface allows working with laser beams which are projected on a surface of the testing object. Hence the operator can correctly maintain a shift step of the antenna array during a complete technical diagnostics of the testing object. 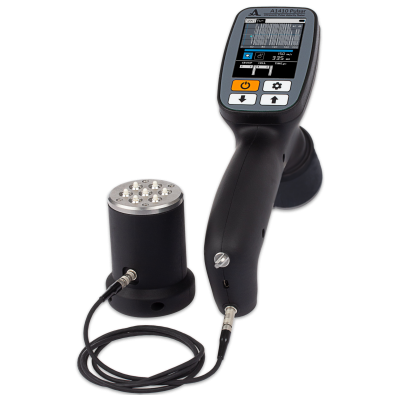 Handheld light-weight body and a repositionable handle provide convenient working with the instrument on the horizontal, vertical and roof surfaces. A reference scale on the lower part of the instrument’s body is designed for convenient localization of the defects relative to the antenna device. Large and bright TFT display and a keyboard allow easy adjustment of the instrument to the testing object, selection of the required operation modes and conduct an inspection, watching the results obtained, which allows their initial analysis. Inspection is carried out as step-by-step sounding of the testing object with data combining and volume reconstruction over the whole scanned surface of the testing object. Inspection of concrete constructions up to 2500 mm thickness for the purpose of evaluation of consistency of the construction. Inspection of reinforced concrete constructions up to 800 mm thickness for the purpose of evaluation of consistency of the construction. Search for foreign inclusions, cavities, voids, delaminations, leaks of filling and cracks in the concrete objects, reinforced concrete objects and natural stone. Inspection of constructions made of marble and granite up to 2 000 mm thickness. Search for plastic and metal pipes of a diameter more than 10 mm in reinforced concrete. Inspection of the internal structure of carbon rods of a diameter more than 900 mm. Evaluation of condition of the channels with stressed reinforcement in reinforced concrete bridges. Inspection of understructures, columns, overhead covers in cast-in-place constructions to detect voids and leaks of filling. Search for voids and cavities back of liner plates of underground and railway tunnels. Inspection of refractory blocks of the glass blowing furnace. Estimation of the thickness of the concrete cover and depth of coverage reinforcement. Thickness measurement of the testing object at one-sided access. Detailed registration of the results obtained.